I grew up in Pennsylvania and am very familiar with apple fritters. The restaurant that I helped manage made apple fritters as a side dish, we made apple fritter sundaes with them as well. The thought of making peach fritters never crossed my mind until I was talking to my little brother Kevin about what my next post would be. When Kev told me he saw peach fritters at the market, the light came on! Delicious Fresh Peach Fritters…ENJOY! These Delicious Fresh Peach Fritters come together quickly and fry up in about 3 minutes to a beautiful puffy golden brown. Yummy! Can these be made one day ahead without them suffering to much or best not to make ahead? Fritters – yum! I was just talking about fritters the other day! I so want to make some. Do you think if I used Apple I would have to cook them first? Can’t wait to try this recipe! Aviva, they really are best eaten the day you make them. If you wanted to make them one day, but not put the glaze on them and reheat them in the microwave that might work. Val you made me laugh! I’d be right there with you! Lisa, You could saute the apples first, that would give them an awesome flavor in the fritter! And you could use ice cream caramel on top and have CARAMEL APPLE FRITTERS!!! Let me know what you do, I can’t wait to see them! Yum! Now is the perfect time to make this. The road side markets are loaded with juicy peaches. i’ve never been a fan of apple fritters. Buuuuuuut, peaches! I’d shove Val aside, to get my hands on these. Mouth watering photos, girlfriend! Lisa I hope you get a chance to make them they were so easy and good! Debby ! LOL!!! I’ll swap you peach fritters for your PUMPKIN SCONES!!!! 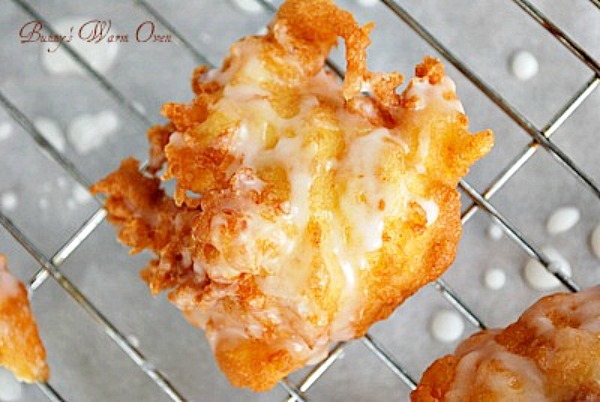 Does the oil have to be deep enough to cover the fritter? Anonymous, you don’t want to just coat the pan with oil to fry them. They do need more oil than that. I’d say use a small sauce pan so you don’t use alot of oil. They do need to float in it so you can turn them over to fry the other side. Can I use caned peaches ?? Paula, YES you can use canned peaches!! I love fritters, I can’t wait to try your recipe with fresh peaches. Thanks so much for sharing your recipe. Pinned/shared. Oh my goodness, these fritters looks out of this world good!!! My sister and I had lots of fun making these tonight! Had them with some peach ice cream and salted caramel sauce, very tasty. Thanks for sharing the recipe! Bunny, you evil woman….tempting us with these orgasmic looking delights. Good Lord, now I’m “GOING TO HAVE TO TRY THESE”. Thank You my dear….great pics also. I’ll be checking back! Try using nutmeg or mace instead of cinnamon. You will be amazed at how well these spices really bring out the peach flavor. But only use about half as much because these spices are more potent than cinnamon. Just finished making these. Omg! The deliciousness should be a sin! Anonymous thank you so much for coming back to tell me you made and loved them! It’s amazing how something so easy could be so GOOD!! Love this recipe. I just bought some fresh peaches today from my Amish neighbor. I will be busy this evening. Whenever I use cinnamon in a recipe I always use 1/4 to 1/2 tsp. of fresh grated nutmeg. Love the combination. Made these this morning for a sweet breakfast. I didn’t put a lot of glaze on them. Told my 3yr old they were donuts cause he will actually eat a donut, lol. We all loved them 🙂 Thanks for the easy recipe! Your welcome Jenni!! 3 yr olds can be picky when it comes to food. I remember my son only wanting hot dogs what what seemed like forever. so happy he loved them!! All purpose or self rising flour ? Hi Brittany, all purpose flour. 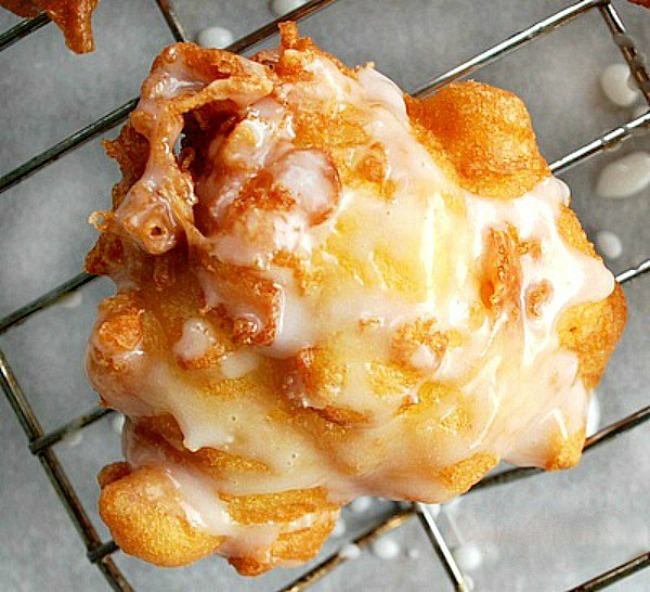 I have never had a fritter of any kind before but these look SO good. Im going to pin this to make later because I think my husband would love them! Stephanie I know my husband loved them! Thank you for pinning! I feel like fritters are one of those foods that have fallen to the wayside in recent years… I’m glad to see I’m not the only one who makes them (and to have a new recipe to try!). Thank you Jerusha! I guess it helped that i worked at a restaurant that would make homemade apple fritters and then use them in sundaes! I have made apple fritters many times, but never thought of putting peaches in them. They look so yummy! Thank you Bev, you’ll love these fritters. They’re so easy to make a delicious! Oh heavenly! Pinned for later. Oooooh, girl! These look fabulous! I wait in line at Thomas’ Donuts for an apple fritter in Panama City Beach whenever we go on vacation. I would totally stand in line for these. Yum! Sharing on FB! From one displaced Pennsylvanian to another thank you for this. I made them with nectarines and they were the perfect thing after a bad day! Nice adaption Michelle, I bet they were great!! I love apple fritters, and peach sound even better!!! Can you please tell me, can you freeze these after you fry them. I made them, sat down to have one…… but they were already gone. Darn that peach fairy. Just thought maybe I could get ahead. Cindy I’m happy they were a hit at your house! I’ve never frozen them because the same thing happens at my house when I made them. They disappear before you know it! When it says to put the fritters in the bowl of sugar, is this the glaze or just regular sugar? Good morning Sarah! The sugar would be just sugar (regular sugar) if you wanted to coat them instead of glazing them. I been looking for easy desserts to do after dinner this is perfect however my husand isn’t a fan of peaches can I use canned apples for pie filling or frozen apples. Lisa, canned apples would probably be better, minus the liquid if that’s possible. The peaches I used were very ripe so canned apples wouldn’t be much different that very ripe peaches. Let me know how it goes! Oh my word, I just can’t even, these look so good!! Filing this away until peach season. Thinking that ginger in the glaze could be something really special- I just love ginger and peaches together. Kirsten ginger would be a very nice addition! Should the fresh peaches be peeled? Hi Heather, yes the peaches should be peeled. You can peel them easier if you put them in boiling water for a minute or two. The skins come off very easily. Have you heard of anyone trying them with gluten free flour?? Haven’t done/tried frying with GF flour. Lisa I’ve never used gluten free flour in anything. If you make them that way please come back and tell me how it went. what kind of oil do you use, and how many inches high do you put in oil? Thank you. Yes Tiffany you have to peel them, but if you put each peach into boiling water for just a minute or two the skins come right off. Fantastic! These were a huge hit with my group of friends. I had some leftover peach simple syrup (homemade) from making peach bread, so I put that together with confectioners sugar to make the glaze. Oh that sounds so good Alyssa, simple peach syrup made into a glaze!! I love the way your confectionary mind works!! I’ve never doubled the recipe Carol,but you might have nailed it thinking it was the baking powder. I hope you try them again! I am still frying the last of these up. 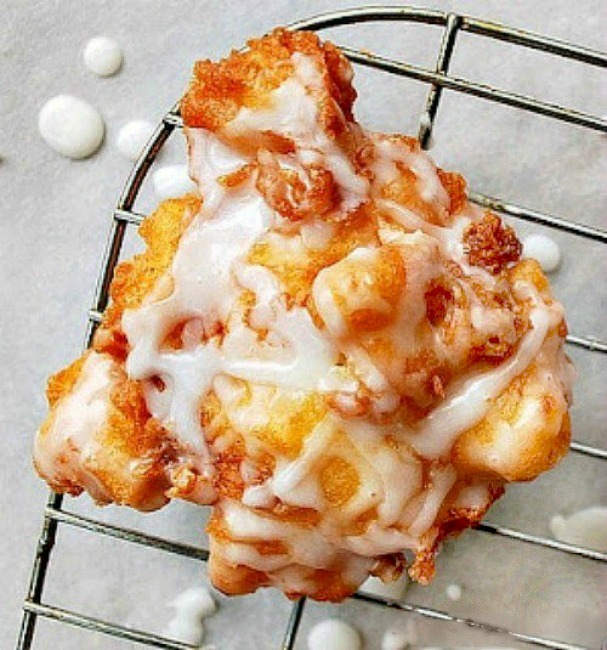 I have to tell you I tried an apple fritter recipe and it wasn’t good. So I was hesitant to try a new “fritter” recipe. However, I absolutely love these. Thanks for sharing. I will use this recipe for my apple fritters as well. Well now I’m going to have to try this with apples Nancy! Thank you for coming back to say you made the fritters and that you made them your way with APPLES! I can’t wait to try out these! Looking at the pictures has got my mouth watering! You’ll love the fritters Vivian! Can this recipe be baked instead of fried? No Kris, they really need to be fried. hi! how much oil should i use? while frying should i flip them to the other side? Sylvia enough oil so they float a little bit in the pan (like doughnuts would float) and yes then you can turn them over. About 2 inches Sylvia, just enough so the dough floats and isn’t laying on the bottom of the pan. Hi Bunny! The flour, self rising or all purpose? I see some baking powder as well and that usually means all purpose. Thanks!! You got it Larry, all purpose. Just made these to go along with our Memorial day breakfast. Everyone loved it! Probably should have made more because all the peach fritters were devoured 😊 Thanks for the recipe! You’re welcome Jenelle!! Thank you for coming back to tell me! I would like to take them Sunday morning as I am in charge of treats for Sunday school class. Can I put the batter in the frig and get up early and fry them? Jo i’d say make the batter, cut the peaches up but don’t put them together until you make them. Oh my pants! Just made these and my husband and I each downed 4 with hardly a breath inbetween! Delicious! LOL!! Fantastic Kirby, I love it! Thanks for coming back to tell me you made them. What type of oil is best to use for these? Hi Mary Ann, regular vegetable oil works just fine. Bunny, how many fritters does this recipe yield?? Kimberly I forgot to write the recipe yield in the recipe, and worse I don’t remember how many it made! It will depend on what you use to measure the batter out with, but I’m going to guess was about 7 – 10. I LOVE fritters. we’re going to buy peaches to can next week so will try this too. I’ve made doughnuts before so I should be able to do the fritters. I don’t imagine they’ll even get a chance to get cold–my husband and I will eat them!!! You’ll love them Vera, you may have to make a double batch, one for you and one for hubby! Let me know how it goes for you, would love to hear. Could you add a handful of blueberries with the peaches? That would be a great combination Missy! Maybe cut back on the peaches a little, then whatever amount of peaches you cut replace it with the same amount of blueberries. Let me know how it goes Missy! Could you use frozen peaches for this? Maybe if they were drained? Yes Sherlyn, but as you said, drain them really well before putting in the batter and frying. Let me know how it goes for you! Do you blanch the peaches first to remove the skins or just leave the skins on? Blanch or peel them Debb, which ever you prefer. Hello. I love this recipe its perfect for making a treat for my coworkers. Since you stated that they should be eaten fresh, I’m wondering if I blanch the peaches now to cut them up and put them in a freezer bag. How long would they hold a day in a half? Today is Monday but I’m not going to cook them until Wednesday morning. I’m hoping they aren’t mushy. What do you think? Dawn I don’t know if they would turn color in the fridge in two days? Hopefully not. I pinned this recipe a few days ago and realized that I had a small can of peaches. This recipe is so quick and easy and delicious! Now to try not to eat them all before someone gets home! Stephanie that’s the hard part isn’t it! Thank you for coming back to comment , I appreciate it! Yes that’s the hard part isn’t it Stephanie, I’m so happy you made them and loved them! I adjust wanted to bbn let you know that they did not turn brown. Considering I was getting up at 5am,I wanted them already cut up. Well I brought them to work and everyone loved them. Next time I know that I’ll have to make a double batch. Thank you again for a great recipe. Just finished these. I used a large spoon to drop them. The batter spread more next time I will use smaller. I have made Apple fritters but never peach. These are really good. I will make again. Hi what kind of oil should iuse? Do i use a candy thermometer? Hi Donna Just use vegetable oil. I’ve never used a candy thermometer, I just get the oil hot and put a little batter in it to see if it cooks but a candy thermometer would probably be the best way to tell if it’s hot enough. You could simmer them for a little bit Jane, not to much though. Let me know how it turns out for you! Mine are not staying together and making a pretty fritter, it is breaking off into balls. What am I doing wrong? Geez Jennifer I don’t have a clue, how big did you make them? I am going to make these for our weekly game night desert. I will let you know how they turn out and if everyone likes them. I made these for game night and they were a big hit. I used gluten free flour and my peaches were fresh frozen. I’m going to make the next batch using blueberries. These look so good! What a great idea to bring to an Easter brunch potluck!